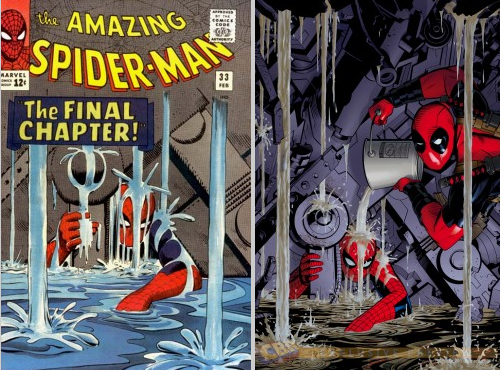 The original “Amazing Spider-Man” #33 cover (L) and the “Amazing Spider-Man” #7 Deadpool Variant by Michael Golden. 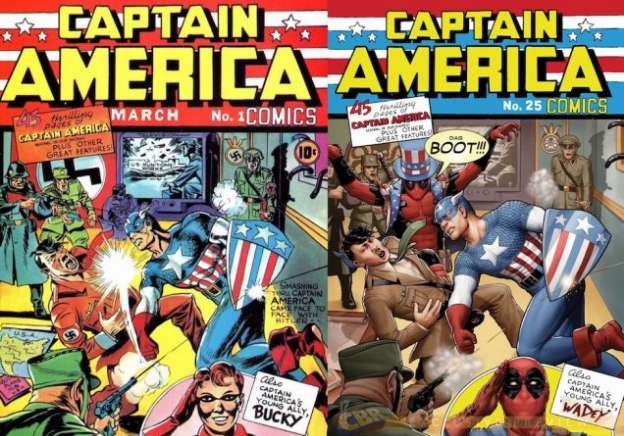 Deadpool is known for sass and wit– so for Marvel’s 75th anniversary its pretty in his character to photobomb the iconic covers in marvel’s history. Throughout October, Deadpool guests stars in various covers such as “New Avengers”#1, “Marvel Comics” #1, “Captain America” #1 and “Amazing Spider-Man” #33. A nod to the classics, John Tyler Christopher drew Deadpool’s variant even in the “Captain America #25″ cover. The remakes of these covers with Deadpool’s classic disruption of the fourth wall and his foul mouth ways are fan favorites, particularly after the “leaked” test footage of Ryan Renold’s voicing the character back in August. While the Deadpool movie is still in question, there are still high hopes from fans and critics alike. If the test footage showed viewers anything, there is a hint at Deadpool being a live-action/CGI hybrid and a R-rated film (which makes sense with the violence and how Deadpool operates). The 75th anniversary tributes make me just really want Deadpool to permanently join the Avengers… ah, what an adventure that’d be.